Victim Offender Conferencing was published as KAP’s 5th book of the Justice and Peace-building Series. Kingdom Builders is starting up again. On June 1st, Jesus Village Church and Jesus Heart Church delivered donations for Nepal relief to Mennonite Central Committee (MCC) Northeast Asia Branch through KAC. August 8-21 Northeast Asia Peacebuilding Institute is inviting you to their Peace Training Program. KAC’s sister organization NARPI (Northeast Asia Peacebuilding Institution) introduces programs conducted at its training center. This year NARPI welcomes it’s 5th year of summer peace training programs for its training center on August 8-21, a total of 12 days, hosted in Ulaanbaatar, Mongolia. May 15th 2015 is International Conscientious Objectors’ Day. Last year, the UN Human Rights Mission cited a report by South Korea Amnesty International stating that 92.5 % of the world’s conscientious objectors are in Korea. The number of world’s prisoners for conscientious objection is 723 people, 669 of those prisoners being in Korea alone. This is truly an exorbitant work. For a short period of time Protestantism didn’t form any growth. “God calls us to love our neighbors as ourselves, while loving our enemies”. Palmer Becker has lived among Anabaptist Church pastors and educators all his life. Anabaptists have summarized their understandings of the bible into 3 simple core points. The revised and enlarged edition of the book applies down to earth things to help with life’s perils. The book also has the addition of chapter 11 “A guide for readers”. Become one of KAC 300 Support Members! Already six months time has passes since KAC moved to a new space last year. In this time Mennonite Central Committee (MCC) has been able to establish their office and this plan space has become well decorated and organized. Chuncheon’s Jesus Village Church and Jesus Heart Church begin KAF connection church and fellowship, while KAC is moving forward with new works. 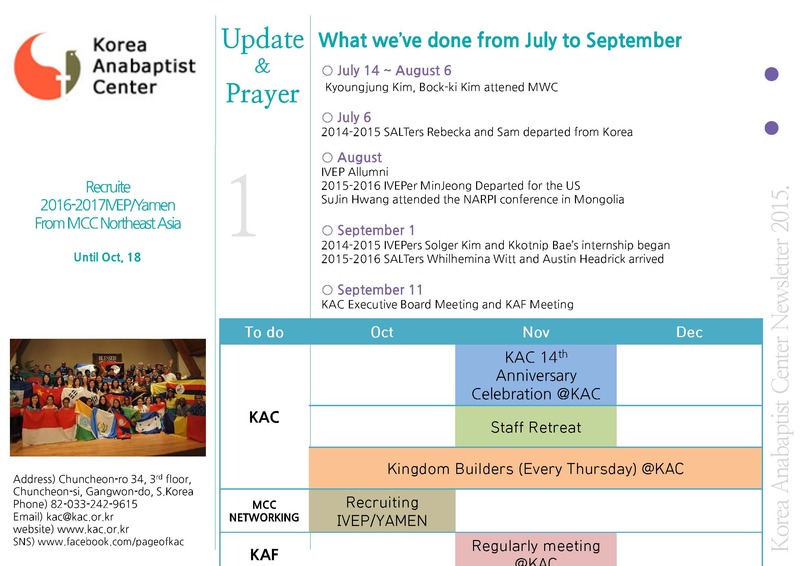 There is now work to do at KAC beginning with Dong Gyu Ahn, the board chair, who directs 7 people. Manager Kyeong Jung Kim, Missionaries Bock Ki Kim and Sook Kyeung Park, Secretary SooJin Hwang, Sam (Samantha Moldovan), who is serving in MCC’s SALT program and will be departing this July, and resource staff member Min Jeung Bae. All full-time translators have difficulties but we will be making efforts to plan for danger with a healthy structure and foundation. KAC considers the peace disciple community’s core values as it continues to develop materials, network and serving in the ministry. Books published among the Peace & Justice Series and Anabaptist Series. Church uses Anabaptist education and development material. Youth & multicultural children’s English teaching material aid. All the recent work could not have be hosted by God’s guiding spirit and KAC without receiving sponsor’s prayers and support. KAC requires 300 individual sponsors and support to take care of these works and push forward.